Ever look at a group of fit healthy people and wonder what makes them tick? What is it about fit healthy people that makes it look so easy for them to be thin and in shape? Well it’s not always just in their genetic makeup. I used to think that was the case. Thin, fit people were just made differently than overweight out of shape people. That is definitely not the case. There are lifestyle choices that make the difference. Never, ever say the word diet. Fit, healthy people have a lifestyle of eating a variety of foods that are healthy. They may have an occasional unhealthy food, but they don’t make it a habit or focus on it. They allow for those times by eating healthy consistently. They eat to live, not live to eat. Drink plenty of water everyday. Fit, healthy people drink 64oz – 148oz of water daily. They know the importance of water in weight loss, healthy skin, and overall feeling great just to name a few benefits. Exercise is sometimes fun, but always necessary. Fit, healthy people find fun ways to do to get up and moving in addition to the organized workouts. They realize exercise is difficult but necessary. They look forward to the great feeling after a workout is complete. They also look for ways to move more such as taking the stairs instead of the elevator, parking farther from the store to get an extra walk in. Fit, healthy people schedule their workouts into their busy lives and don’t allow excuses to take up their time. Even if it’s a quick 15 min HIIT workout, they make sure workouts are a priority. Track movement & set goals. Fit, healthy people have one of the many fitness trackers available to help meet their activity goals. Fitness bands are a great motivator to be able to watch daily progress of calories burned and activity. Fit healthy people understand the importance of getting enough sleep every night to be able to wake early and maintain the level of energy required to sustain the activities and workouts for the day. The average active person needs about 7-8 hours of sleep each night. Don’t stress about the scales. Fit healthy people don’t care what the scales say. It’s all about how they feel and ability to do the things they want. What comes first, the chicken or the egg? Is it that fit healthy people are happier with their active lifestyle which promotes a positive outlook, or do they have a positive outlook and so they are able to be active? Doesn’t really matter, I guess, as long as the positive outlook is there. Have friends who are fit. 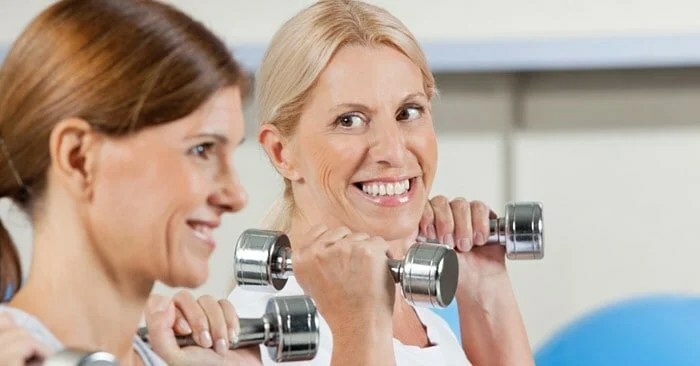 Fit healthy people have friends who are also fit to enjoy activities with. Social time isn’t about eating and sitting, it’s about moving and having fun. Continuously educate themselves with health & fitness news. Fit healthy people stay up to date with the health topics and new discoveries on fitness training. Being mindful of the science behind a healthy lifestyle is another motivating factor to live healthy. Need some extra support in your weight loss and fitness journey? Join the Facebook Group, Women Over 40 Losing Weight & Living Healthy today!